Jack McInerney went more than four months without scoring a goal. But when he finally broke that slump, he sure picked a good time to do it. The striker bagged a late equalizer for his 11th goal of the season and first since June 1 as the Philadelphia Union salvaged a 1-1 draw at lowly D.C. United this Saturday. United, which got a gorgeous first-half strike from Nick DeLeon, extended its winless stretch in league play to 10 matches. The Union, meanwhile, passed the New England Revolution for the fifth and final playoff position with two games left. After creating a slew of chances early, United took the lead in the 36th minute. Collecting the ball 40 yards from goal, DeLeon seized the space in front of him before launching a long-range blast past Zac MacMath. United nearly doubled the advantage two minutes later when Conor Doyle rang the post. And Philadelphia had a golden opportunity just before halftime as Kleberson buzzed a free kick just over. D.C. nearly iced the game late when Doyle rounded MacMath, but the goalkeeper recovered and made a lunging intervention. Moments later at the other end, Bill Hamid came up with a big save on McInerney. But McInerney got the last laugh in the 90th minute, running onto Kleberson's cross and nodding it home at the far post for his first goal in 1,027 minutes played. Chicago Fire sprinted out to a big lead but had to ride out a late FC Dallas fightback to win 3-2, a result that eliminates Dallas from playoff contention. 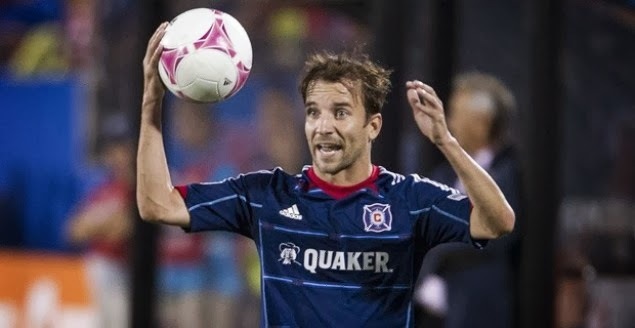 Chicago took the lead in the 25th minute, as Mike Magee's corner was headed in by Juan Luis Anangono. Magee "scored" his team's second a few minutes before the interval, when Alex's effort deflected off the forward's face to give him a 19th goal of the year, tying him for the MLS Golden Boot lead. Jalil Anibaba scored a spectacular third for the visitors in the 52st minute, turning to unleash a 25-yard dive to flew across the fact of the goal and beat Chris Seitz. Dallas pulled one back in the 63rd minute. David Ferreira whipped in a cross and Kenny Cooper used his strength to hold off Gonzalo Segares, turn and put a shot past Sean Johnson for his fifth goal of the season. Cooper scored a second in the 75th minute. Jackson and Segares became entangled in the box, and Dallas was awarded a penalty by referee Kevin Stott. Cooper stepped up and put his shot right down the middle to bring the Hoops within a goal. Chicago goes to fifth in the East with the win, tied with fourth-place Montreal and sixth-place Philadelphia on 46 points but ahead of the Union via the wins tiebreaker. Dallas is mathematically eliminated from the playoffs with two games remaining.